Graveler is a Rock/Ground type Pokémon introduced in Generation 1. 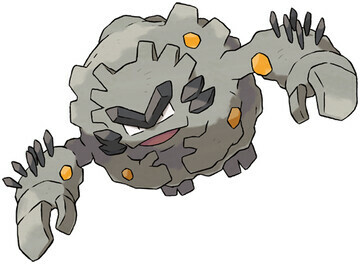 It is known as the Rock Pokémon . The effectiveness of each type on Graveler. In Generation 1, Graveler has a base Special stat of 45. In Generations 1-4, Graveler has a base experience yield of 134. Rolls down slopes to move. It rolls over any obstacle without slowing or changing its direction. Often seen rolling down mountain trails. Obstacles are just things to roll straight over, not avoid. With a free and uncaring nature, it doesn't mind if pieces break off while it rolls down mountains. A slow walker, it rolls to move. It pays no attention to any object that happens to be in its path. It travels by rolling on mountain paths. If it gains too much speed, it stops by running into huge rocks. GRAVELER grows by feeding on rocks. Apparently, it prefers to eat rocks that are covered in moss. This POKéMON eats its way through a ton of rocks on a daily basis. Rocks are GRAVELER’s favorite food. This POKéMON will climb a mountain from the base to the summit, crunchingly feasting on rocks all the while. Upon reaching the peak, it rolls back down to the bottom. Be careful while hiking on mountain trails. GRAVELER may come rolling down the path without slowing. They descend from mountains by tumbling down steep slopes. They are so brutal, they smash aside obstructing trees and massive boulders with thunderous tackles. GRAVELER make their homes on sheer cliff faces by gouging out numerous horizontal holes. It tumbles down slopes, heedless of any body parts chipping off. It eats a ton of rocks daily. It rolls on mountain paths to move. Once it builds momentum, no Pokémon can stop it without difficulty. With a free and uncaring nature, it doesn’t mind if pieces break off while it rolls down mountains. Mossy rocks are its favorite food. It can devour a ton a day while crunching loudly. This slow-footed Pokémon moves by curling up and rolling instead of walking. With enough momentum, its speed can exceed 60 mph. It climbs up cliffs as it heads toward the peak of a mountain. As soon as it reaches the summit, it rolls back down the way it came. It travels by rolling down cliffs. If it falls into a river, it will explode with its last gasp. Its preferred food is dravite. After it has eaten this mineral, crystals form inside the Pokémon, rising to the surface of part of its body. They eat rocks and often get into a scrap over them. The shock of Graveler smashing together causes a flash of light and a booming noise. Graveler’s entire body is tinged with electricity due to the stones it likes to eat. It’s very quick-tempered. Graveler learns the following moves in Pokémon Let's Go Pikachu & Let's Go Eevee at the levels specified. Graveler learns the following moves in Pokémon Ultra Sun & Ultra Moon at the levels specified. Graveler learns the following moves via breeding in Pokémon Ultra Sun & Ultra Moon. Details and compatible parents can be found on the Graveler egg moves page. Graveler can only learn these moves in previous generations. It must be taught the moves in the appropriate game and then transferred to Pokémon Ultra Sun & Ultra Moon. What would happen if I trade a regular Graveler in Alola? Does Mold Breaker block the effect of "Additional Ability" items such as Air Balloon?